It’s hard to believe we’re down to our last five days of hiking on the Pacific Crest Trail. The morning Grit and I left Holden Valley, the rain had stopped. The skies were blue and the sun was shining. According to the newly posted weather forecast, the clear skies and warmish weather were going to stick around for the next five days, just enough time for Grit and I to make it to Canada into Manning Park. Spirits were high as we hopped on the shuttle from Holden Valley to Lucerne Landing, where we’d catch the ferry to Stehekin. On the shuttle ride down to the ferry, all of us Hiker Trash sat in the back of the shuttle sharing our favorite trails stories and the lessons we learned along the way over the last five months. Everyone was in a good mood. The sun was out. The sky was blue. It was even a tad bit warm outside. Perfect hiking weather. The ferry ride to Stehekin was less than an hour. While onboard, Grit finally had access to beer and I had access to my first root beer in over a week, satisfying both of our vices before making it into town. Once off the ferry, Grit and I headed up to the ranger station to get our overnight backpacking permits. We needed them to spend the night in the North Cascades National Park. Once we had our free permit, we hopped on the bakery shuttle and headed to the highly anticipated Stehekin Bakery. Yes, the Stehekin Bakery has its own shuttle that runs from the ferry landing to the bakery. Talk about convenient. The bakery was everything I had hoped and dreamed it would be. Upon arrival, Grit and I saw our favorite French couple, Gourmet and Pinenut. Since I hadn’t ate lunch yet for the day, I felt like I ordered one of everything – a slice of veggie pizza, a made-to-order deli turkey sandwich, a side of potato salad, a blackberry scone, a cheddar and chive biscuit, a slice of fresh apple pie with whipped cream and vanilla ice cream and an iced cold root beer. I polished off the slice of pizza and pie and root beer at the bakery and took everything else with me to go on the trail. The four of us – the French couple, Grit and myself got on the second to the last shuttle of the day and headed towards the trailhead. Most hikers opted to spend the night in Stehekin, but since we had taken a zero at Holden Valley, we decided to get back on trail before it got too late in the day. The hardest part about a town day is always getting out of town. Even if we only hike out a few miles, Grit and I always considered getting out of town a win. We ended up hiking out 11.5 miles today. Not too shabby for a town day. We hiked all the way to Six Mile Campground and got there just before dark. The campsite was with loaded with other hikers, both PCT thru-hikers and a group of section hikers who had funny things like mugs, hand warmers and heavy tents. Before I went to bed that night, I dined on my made-to-order deli turkey sandwich and the potato salad I’d brought with me from the bakery. It was delicious. In the morning, I ate my blackberry scone from the bakery for breakfast. Quickly after finishing it, I had bakery buyer’s remorse and wished I’d bought two scones instead of just one. I still had the cheddar and chive biscuit in my food bag, but wanted to save it for either my morning break or for lunch. The biscuit lasted in my bag for another three hours before I pulled off the trail and devoured it. Within less than 24 hours, all of the baked goods I’d gotten from the Stehekin Bakery were gone. By lunchtime, I’d reached Rainy Pass and Highway 20. As I crossed the highway and walked towards the trailhead, I saw a blue tent off to the side – Trail Magic! It was Mad Baker, whom I’d read about earlier in the comments on Guthook. He was set up in the trailhead parking lot making chicken curry and handing out sodas to hungry PCT hikers who stopped by. I was stoked. I was starving and the food was delicious. Plus, I ran into two other fellow hikers, Deadzone and Spirit while having lunch at the trail magic stop. Spirit gave me one of the 2018 PCT Hiker Trash patches she had made. I can’t wait to put the patch on my pack. After lunch, there was a bit of a climb up to Cutthroat Pass. On top of the climb, there were plenty of clear, blue skies, sunshine, vibrant fall colors and incredible views. I was stunned by the scenery. With all of the blue skies and sunshine, I felt spoiled with the mind-blowing views. Each pass we climbed up and over, the views kept getting better and better. The scenery after Cutthroat Pass was stunning. The trail continued to walk along a ridgeline. Ridgelines are my favorite! And since the trail stayed up at a higher elevation for the rest of the day, we were rewarded with incredible views along the way. Towards the end of the day, we past Mile 2600 and its mile marker made of rocks. I snapped a picture. In less than a mile after the mile marker, I ran into Grit and the French couple. We came across a large, flat, exposed tentsite next to a stream and decided to camp here for the evening. We’d hiked a total of 17.8 miles for the day. I woke up to a sheet of ice on the outside of my tent. It was a full moon the night before and was hands down the coldest night on trail so far. I had slept with all of my clothes on including a pair of gloves, my fleece, puffy jacket and a pair of toe warmers on the bottom of my socks. After breaking down camp and hiking to the top of the pass, I came across Deadzone and another hiker whom had experienced a near freezing evening/early morning as well. The weather was changing in Washington fast. The nights were starting to get much colder. Grit, the French couple and I spent lunch at a tentsite near a creek. While eating lunch, I also took the opportunity to dry my tent off in the sun, on the bridge, in hopes of some of the ice melting off before I had to put my tent back into my pack. We spent the rest of the afternoon climbing. We all took a short break at the top of the next climb. It was hard not being overwhelmed by the views. At one point along the trail, heading towards Hart’s Pass, I was surrounded by the most amazing and vibrant fall colors I’d seen on the trail so far, I even got to walk through a couple of sections littered with larches. The scenery in this section was unreal. Thanks to the clear blue skies and sunshine, we were able to enjoy some epic views. I got to Hart’s Pass a little bit after 6pm. I was greeted by a trail angel who offered us filtered water, fuel to cook our dinner so we didn’t have to use up our own, gave us mini bottles of champagne to celebrate at the Northern Terminus the next day and offered to take any trash we had. A couple hours later, another trail angel showed up at the campsite with cold beer. Grit was in heaven. We came across several other hikers in this area whom were walking their victory lap back to Hart’s Pass. A “victory lap” is when a PCT thru-hiker reaches the Northern Terminus at the Canadian border, taps the monument and turns around to walk back towards Hart’s Pass instead of proceeding into Canada towards Manning Park. Since we’d hiked 21 miles today, we opted to spend the night at Hart’s Pass, at one of the campsites with a couple of other hikers. We were only two days from the Canadian border! The next morning, after leaving Hart’s Pass, the trail started off with a climb. I decided to listen to my favorite “climbing” album, Pink Floyd’s, “The Wall” from beginning to end as I climbed my way out of there in the morning. For the rest of the day, the section we hiked through was gorgeous. It was another day filled with clear, blue skies and plenty of sunshine. We passed a few more hikers doing their victory lap. Everyone was in good spirits. Everyone kept congratulating one another for finishing their hike. Later that evening, we had one last climb for the day, up to Woody’s Pass. As we walked along the mountain side towards the tentsite on the ridgeline we’d planned on camping at for our last evening on the PCT, I listened to the Fleetwood Mac album, “Rumors” from start to finish as I watched the sunset. This would be my last sunset on the PCT. In the morning, we took our time breaking down camp and packing up. I cried as I watched the last sunrise on the PCT. This was it. In less than seven miles, our thru-hike on the PCT would be over. Then we’d cross into Canada and have 8.4 miles left to hike into Manning Park. Grit had started hiking before all of us. I finished packing up and left the tentsite with the French couple an hour later. The last section was literally all downhill towards the monument. Even though this was the last section of the PCT, in true PCT fashion, this section refused to be easy. There was a considerable amount of bushes to bushwhack through. There was a lot of mud to navigate around along the trail. At one point, I literally fell over into a pile of wet bushes on the side of the trail. After I screamed a few choice words and used my trekking poles to help get me back up on my feet again, I continued on down the trail laughing. It wouldn’t be a proper finish to the PCT without at least one fall on my part. As I got closer to the monument, Grateful Dead’s “Truckin” came on my playlist. I could feel the tears streaming down my face. This song had been my hiking theme song over the last five months. In each trail register, including the final register at the monument, I’d always sign with, “Keep on truckin.” And that’s what I had done myself, trucked all the way to Canada. Talk about full circle. I reached the monument a little bit after 10am. I started crying as soon as I saw it. It was surreal. After 153 days, I’d made it to Canada on my own two feet. Grit reached the monument shortly after I did, followed by the French couple. We spent two hours at the monument, drinking our mini champagne bottles, taking several pictures and video of each other, eating candy, laughing and sharing our favorite trail stories with each other. 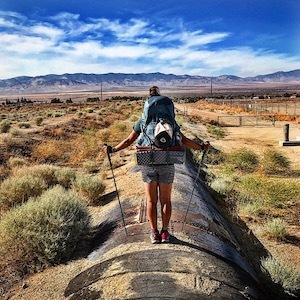 This was the end of the PCT for us, yet it didn’t feel real. We still had another 8.4 miles left to hike to Manning Park after the monument. Once we wrapped up the lengthy celebration, we got back on trail and continued heading north. The trail after crossing the Canadian border was noticeably different. Definitely not the same grade as the PCT trail had been. The last eight miles were like a PCT’s greatest hits to me, including having a bridge to cross, a down tree to climb over, crumbly thin trail in certain parts, lots of mud, a few rocky places, one last campsite and a forest service road that continued downhill and never seemed to end. We all took our last break together on trail at the last campsite before Manning Park. I got back on the trail first because I started feeling myself getting cold. A little way down and a few switchbacks along the forest service road, I saw someone sitting on a log – it was my dad waiting for me. As soon as I saw him, I threw down my trekking poles, started crying and gave him a huge hug. It was at this very moment I knew I had completed this thing. I made it to Canada in one piece, with Grit, just like we had promised each other way back in Big Bear a few months before. My dad looked both worried and relieved, all at the same time. We all caught up with one another after reaching Manning Park – Grit, the French couple and myself. We even managed to catch up to FittyShrimp, one of our fellow hiker trash friends whom had camped at the tentsite along the ridgeline, just above where we were camping the night before. After feasting on a warm meal in the lodge’s restaurant, my dad got us all of cabin where we would spend one last night together, hanging out over a few beers, ciders and glasses of wine. In the morning, everyone would go their own separate ways – the French couple got a ride into Vancouver. We dropped Grit off at the Greyhound bus station in Hope. We dropped FittyShrimp off a little bit before the US border. My dad and I then played tourists in Canada over the next two days as I gently started my transition back into off-trail life. It was really hard to believe this was it. Our PCT thru-hike was over. I loved your posts! You need to compile them or send them off to a sponsor to have them publish it serially in a trade magazine!